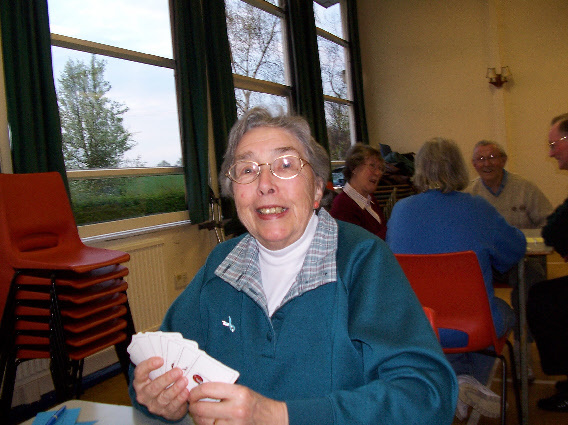 Whist has been played by all ages, both in the family home and in public halls, clubs and whist drives for a very long time. There are many variations of Whist that have developed over time and at Little Hadham Whist Drive we play a type of whist called ‘Semi-Partner’ as below. Whist is played by four players at each table. Players seated opposite one another (partners) compete against the other two players at the table for that particular game. For the purpose of clarity as to who picks up the tricks, players elect to either play “lady” or “gent” before the start of the drive. All four players cut from the pack of cards to decide whom shuffles and deals (after shuffling but before dealing, the opposing player to the right cuts the pack for the dealer). For the cut the Ace is low and the player cutting the lowest card shuffles and deals the cards to the player on his left. This could be a lady or gent player and it is they who subsequently lead the first card of that game. A trick is scored after each of the four players has played one of their cards into the centre of the table. Each player must play a card from the same suit of the first card to be led for each individual trick, provided they have one. The highest card of the suit that has been led wins that particular trick unless a player is void of that suit and plays a card from the trump suit. A card from the trump suit beats all cards in a non-trump suit. The trump suit is pre-determined and indicated on the scorecard and at the front for that particular game. If a player is void of the suit led, they have a choice of discarding a card from another suit or playing one from the trump suit. The player winning the previous trick plays the next card until all 13 cards by each player have been played out in sets of four (13 tricks to each game). Winning tricks are normally picked up by the gent and placed face downwards in front of them but kept separately for ease of counting at the end of each game. Each player records their score (number of combined tricks won by them and their partner) at the end of each game. The pair winning the majority of tricks (seven or more) stay seated opposite one another and play together for the next game, whilst the losing pair split up and move in opposite directions to the next table. The losing lady normally moves to the next highest numbered table and the losing gent moves to the next lower number table. The whist drive consists of 24 games (also known as hands). At the end of the games, everyone totals up their cards and we give prizes for highest total scores, highest halves for both ladies and gents and also the lowest (or booby) scores, again for both ladies and gents. All drives are held in Little Hadham Village Hall. Click here for map or here for our address and contact details. Drives are held on a Thursday – usually the last one of the month except in December where it is the Thursday before Christmas. More details can be found by clicking Dates. To play it costs £2.00 for a scorecard and this includes tea and biscuits. Raffle tickets are 10p each/50p a strip. Any profits go to Little Hadham Village Hall funds. 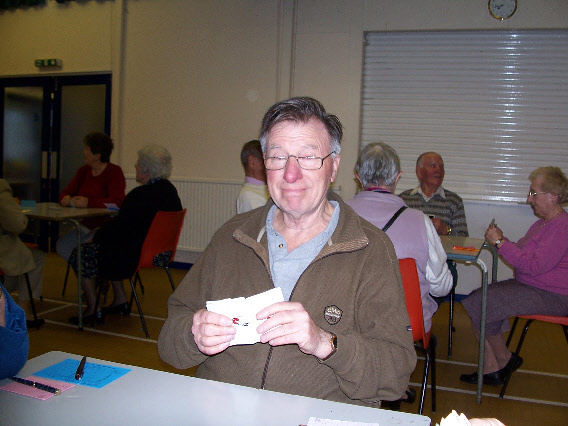 The Whist Drive attracts its’ people from a wide and diverse cross section of the community, of all ages, from a wide geographical catchment area. Existing card players and beginners are always made to feel welcome. We have been going for over 60 years, and some can remember playing in the fifties, others have started coming more recently. If you have not played for a while, or only just know the basics, don’t worry, we’ve all been there, just come along. We play for fun and don’t take it too seriously. You can find out more about Whist Drives on our Frequently Asked Questions page.